Members of the Royal Family gathered in Windsor for the Order of the Garter service at Windsor Castle. More than 7,000 spectators watched the Garter Knights procession through the castle grounds to St George’s Chapel. The Queen, Duke of Edinburgh, Prince of Wales and the Duke and Duchess of Cambridge were among those at the ceremony. The Duchess of Cornwall missed the service after developing sinusitis, Clarence House said. Two new members of the order were invested with their honours. Mervyn King, the former governor of the Bank of England, and Eliza Manningham-Buller, ex-head of MI5, have been appointed to the order. Baron King of Lothbury was governor of the Bank of England from 2003 until 2013, chairing its monetary policy committee. His appointment as a Knight Companion was announced by Buckingham Palace on St George’s Day, 23 April. Baroness Manningham-Buller, who became a Lady Companion, was director general of the security service, known as MI5, from 2002 until her retirement in 2007. She joined MI5 in 1974. The pageboy who fainted during the Queen’s speech on 4 June returned to public duties during the Order of the Garter ceremony. Viscount Aithrie held the Queen’s train during the event. One of the Garter Knights apparently tripped and fell over after the Garter service – but appeared unscathed. The 95-year-old former Conservative foreign secretary Lord Carrington ended up sitting on the ground after his tumble but was soon helped to his feet. Recipients of the honour are chosen because they have held public office, contributed to national life or served the sovereign personally. 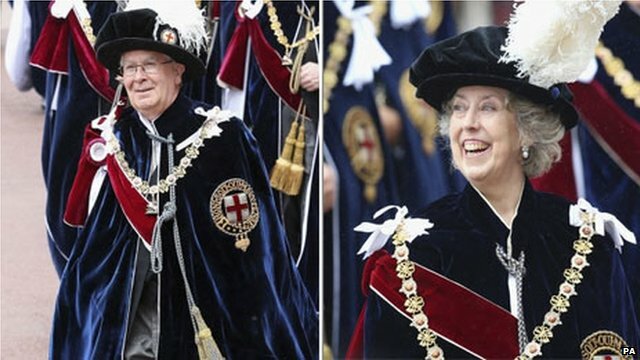 The monarch appoints the Knights of the Garter – strictly limited to 24 people – without consulting ministers. The Order of the Garter service takes place every June on the Monday of Royal Ascot week, known as Garter Day. The knights wear blue velvet robes and black velvet hats with white plumes. The Order of the Garter was founded by Edward III in 1348 and is the oldest British order of chivalry.